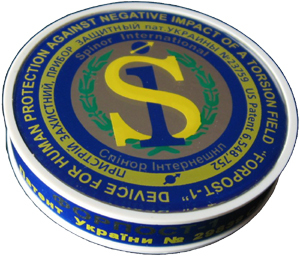 Protective device “Forpost-1" is a reliable and convenient way to protect people from the negative influence of torsion (information) component of electromagnetic radiation emitted by monitors of personal computers, TV sets, other electronic equipment. Recent studies have confirmed that the torsion (information) component of electromagnetic radiation TV sets (monitors of personal computers, other electronic equipment) is the most significant factor in the negative impact on human health. Thanks to the development of electronic engineering a levelof electromagnetic radiation monitors, TV sets is substantially reduced. However, despite the fact that the level of electromagnetic radiation, such as LCD TV sets (monitors) is significantly lower than that of the TV (monitor) with a cathode-ray tube (CRT), the "power" of the torsion (information) component of LCD TV sets (monitors) is almost the same as that of the TV (monitor) CRT. Prolonged exposure to torsion (information) component of radiation TVs, PC monitors can lead to well-being decline may be the cause of headaches, extreme fatigue, cause blurred vision and memory, worsening of sleep; lead to a reduction in the level of leucocytes and lymphocytes in the blood, reduction of immunity; adversely affect the endocrine and reproductive systems. Most sensitive to the effects of torsion (information) fields children and pregnant women. Device "Forpost-1" is a generator of the right static torsion field. In the interaction of the right torsion field generated by the device "Forpost-1", with an adverse effect on human health left torsion field computer monitor (TV, other electronic devices), a mutual cancellation of the fields created biosafety area as front of the monitor (TV), and around it. Created by the device "Forpost 1" bioibezopasnaya zone is a barrier to the emergence of Energy relations between the emitter and the field of man, and as a result, prevents a negative impact on human health. Device "Forpost-1" also can be used to neutralize the negative impact of electronics of Car, trolley buses, subway trains.